Pyramidal Microwave absorber is carbon and retardant chemicals loaded polystyrene absorber,it`s designed to give excellent performance at broadband. JA microwave pyramidal absorber aligned light blue quadrangular pyramid, possessing good fireproof performance which fulfills American NRL Report 8093.Service temperature:-50 ℃~70 ℃. It is of good vertical incidence . oblique incidence . scattering and isolated decay performances at the wideband range. It is mainly used for subject material of anechoic chambers. JAS compound absorber: compound absorber material used for EMC anechoic chambers. It consists of thin ferrite tile, matching sheet and conical absorber material. It can provide enough wideband performance to test EMC anechoic chambers at the range of frequency from 30MHz to 30GHz. Anechoic box: is a wooden box with copperplate or ferrous board in the interspace to shield electromagnetic wave. Absorbers are stuck to the copperplate or ferrous board. Anechoic box is mainly used to test mini-type antenna's or electronic apparatus' capability of receiving &dispatching signals and anti-jamming. 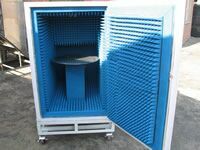 Different dimensions of such an anechoic box are available according to customers' requirements. We could make the absorber as customer requirement , please contact us for details. Looking for ideal Flame Retardant Pyramid Microwave Absorber Manufacturer & supplier ? We have a wide selection at great prices to help you get creative. All the Microwave Absorber for RF Shielding Room are quality guaranteed. 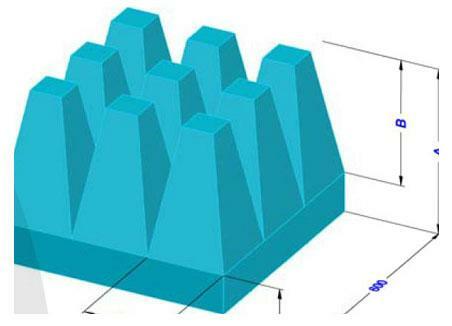 We are China Origin Factory of Pyramidal Foam Absorbers For Anechoic Chamber. If you have any question, please feel free to contact us.